The realms of water, the sea and intuition are by no means dominated by women. Though primarily feminine, to be sure, there are still several masculine deities and energies of water and the ocean. As we are made up of all the elements, though some may be more influential than others, we are all made up of typically “feminine” and “masculine” energies and attributes too. Just as it is vital for women to be in touch with their more assertive, masculine sides, men desperately need to be in touch with their feminine sides and simply with their own Mother Nature, as we have plainly seen throughout destructive, misogynistic history. The men and gods of the waters exemplify this need perfectly and have much to teach everyone, male and female, about balance and beauty. I’d like to begin with a personal favorite – Heimdall, of the Norse and Germanic pantheon. You may be familiar with the name and “character” from, if nothing else, Marvel’s Thor comics and movies. While that is hardly an ideal source for any accurate information about ancient Norse cosmology, it has undoubtedly introduced many to the age-old gods of Scandinavia and neighboring countries. Heimdall, Thor, Odin and the others have been carelessly relegated in modern times to not only the world of comics and over-hyped movies, but often to what is lazily called “Viking mythology”. I should here like to address and put this glaring mis-categorization to bed; there is really no such thing as simply Viking mythology, as the Viking period is but a specific and very limited time in Norse history. It is far more accurate to say Norse or Scandinavian mythology, as these gods existed long before, and long after, what is known as the Viking Age (only 793-1066 CE, not even three hundred years). That would be like referring to Japanese mythology as merely “Samurai mythology”, only worse as the relatively few Nordic people referred to specifically as Vikings did not last even half so long as the elite military class of the Samurai (from roughly 900 to the 1860s, nearly a thousand years). It is the popularity of the comics that are only loosely based on Norse lore, not to mention highly glamorizing TV shows, that have led many people to have serious misunderstandings about what these deities and energies really are, as well as the real stories behind them. Yet there is so much that can be learned and appreciated from the rich history and lore of these countries and their pre-Christian spiritualities. Thor is often lovingly and only half-jokingly called the “gateway god” to Paganism, most particularly Asatru, which is the faith of those “True to the Aesir”, also called Heathenism. Thor and Heimdall have many adventures and exploits together, often on the behalf of the goddess of love and magic, Freya. In addition to Thor, Heimdall is one of the very few specific male deities/energies with whom I work, have forged a strong understanding and even have certain personal elements and qualities in common. If your knowledge of Heimdall comes only from what you have seen in the movies, you may be at quite a loss as to why I write about him in the context of water deities. However, that is indeed what he is, among other things, though many popular representations don’t do him justice. Heimdall is often considered one of the Aesir, the race and generation of gods which includes Thor, Odin, Frigga, Baldr, Sif and others. One of his epithets is “The Shining Ase” and he was indeed beloved by all those gods. He seems to have been just as frequently, if not more, included with the Vanir – the other, more wild and earthy race of gods – as is stated by Helene A. Guerber in her classic “Myths of the Norsemen”. Freya Aswynn, one of the world’s leading authorities on the runes and a priestess of Wodan (Odin), also posits in her excellent book “Northern Mysteries and Magick” that Heimdall is actually one of the Vanir due to his repeated connections to the Vana Freya, and by extension to Njord (or Niord), the god of the Sea and father to Freya and her twin brother Frey. This makes much more sense to me than classifying him as one of the Aesir, and reinforces his primary element of water. Yet it is my personal belief that he is at once perhaps both and neither, though more likely neither. Heimdall is very much an “in-between” being, in almost every way. He guards the Bifrost, or the Rainbow Bridge, which connects our earthly realm of Midgard to Asgard, the dwelling of the Aesir. Being a bridge, it is not technically part of any world. He is also very unique and pure among the gods in his origin, appearance, character, his abilities and qualities, not to mention his role as a most vigilant and steadfast guardian between worlds. He also possessed a swift, golden-maned horse named Gull-top, who carried him back and forth over the bridge. Horses are well established in multiple stories and mythologies as sojourners between the worlds, another being Odin’s own magical, eight-legged steed Sleipnir. All these things speak to Heimdall’s firm position “in-between”. His most obvious connection to Water comes from his nine mothers who were the Nine Waves of the ocean. They are considered to be the daughters of Njord, who then of course would be Heimdall’s grandfather, supporting Aswynn’s assertion of his status as a Vana. It has been my belief and conjecture that he began as a Vana, or at least closely related to the Vanir, and sort of evolved into his own separate and in-between state, especially once he took the appointment by the Aesir to guard the Bifrost. His solar qualities, his descriptors of “shining”, “bright”, and his associations with the East and the new day also attribute to him his secondary element of Fire. Indeed he is “fire born of water”, as Aswynn eloquently puts forth. This both links and opposes him to Loki, the god who is wholly uncontrolled fire, and the two are fated foes who destroy each other at the Ragnarok, the destruction of the world that brings forth a new world and a new generation of gods. Heimdall in fact takes the form of a white seal when he fights Loki, therefore a totem animal for him and another link to his primary element of Water. 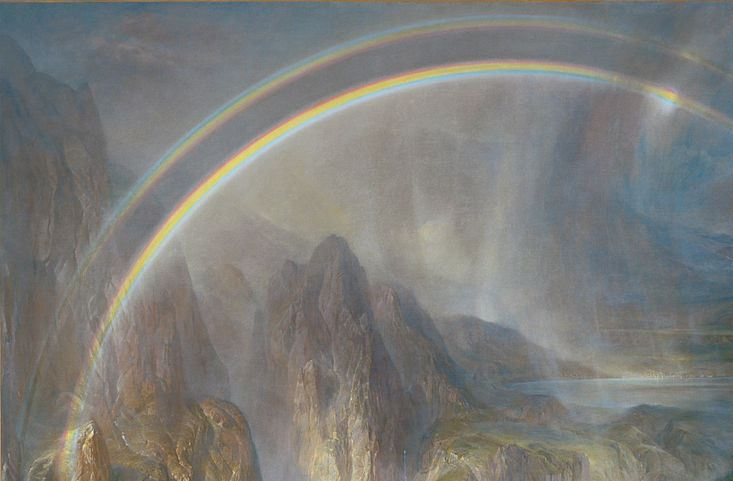 As the warder of the Rainbow, Heimdall was also the god of the rains and dews which quenched and refreshed the earth. He clearly embodies the forces of light, protection, life and all that supports and nourishes life, especially water. We see a natural cycle reflected in Heimdall and his role, as he was first conceived and born Below, by and through the ocean, and ascended as a pure and shining god to the role of a protector beloved of all the gods and the only one charged with guarding the sacred Rainbow path from Midgard to the higher realm of Asgard. From Above, where he dwells and stands watch, he sends pure water back down to the Earth that is under the vigilance of his most sharp eyes and most acute hearing. What could be a more poetic allegory and representation for the beauty, necessity, purity and protection that Water affords us, both physically and spiritually? Water is everywhere, is vigilant, aware and sees, holds, hears and remembers everything. So too does Heimdall. As stated before, he often acts as a sort of guardian and champion to Freya. With the help of Thor, who primarily represents strength and fertility, he serves her and performs important tasks for her, often defending her against the mischief of his enemy Loki, as when he stole Freya’s enchanted necklace Brisingamen. More than beauty, love, sexuality and magic – or rather as all of these combined – Freya ultimately represents life itself, as she is indeed the only one of the original gods of both races who survives Ragnarok. Life goes on and cannot be stopped. Heimdall’s connection to and frequent protection of Freya represents the inextricable link between water and life, and the need life has for both light and water. Water belongs to itself, generates and regenerates itself and exists in a perpetual cycle that rises and falls between the realms and, together with radiant light, creates both life and the beautiful illusion that is the rainbow. This is the very spirit and elemental power that created and is represented by the deity Heimdall, who is fire born of water, and the magical guardian between the worlds who ensures, even through his own sacrifice, that life will always continue. Hail to you, hail Heimdall!